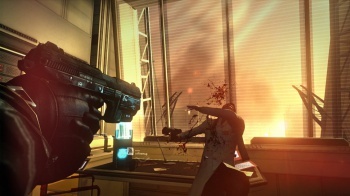 EA insists that rebooting the Syndicate series with a first-person shooter was "the right choice." The decision to turn Bullfrog's venerable, real-time tactical series into an FPS was met derision from fans, many of which accused publisher, EA, and developer, Starbreeze, of trying to cash in on the recent success of Deus Ex: Human Revolution. While Syndicate has thus far failed to set the world on fire - it's currently standing at 76 out of a 100 on Metacritic - EA producer Jeff Gamon stands by EA's decision to change the series' genre. "So a lot of people playing this game would probably have heard of the original Syndicate but not necessarily have played it," he told Eurogamer. "Obviously we get asked a lot about the reaction of fans of the original to us taking it into first-person direction. But we have to maintain that was the right decision. Why remake that classic in its original form when it's still out there? So with a whole new audience and tastes in video games, and a whole new suite of platforms to develop for, the game we made was the right choice." Syndicate's lead co-op programmer, Lars Magnus Lang, echoed Gamon's sentiments. "I knew that no matter what we did people would have strong opinions about it," he said. "I can be the same with some games, also. I can still feel like, oh, did they have to do that?" "They might have heard of it, but most people haven't played it," he continued. "We wanted to cater to those people also, to everyone. I'd rather make a really good game for our players and make them really enjoy it, than just make a copy of an old game with updated graphics. That's not that super fun for either the end user or us. That game already exists." Lang then compared the fan reaction to Syndicate to the negative press Fallout 3 received when it was first announced. "I remember Fallout 3 also had the same thing. It is kind of forgotten now because it was great. Almost everyone liked it. There's always a few..." he said. The two aren't exactly alike. Fallout 3 marked a change of perspective for the Fallout series, rather than a change of genre. Despite occasionally looking like one, Fallout 3 is definitely not a first-person shooter. "We make it good on its own merits, then we take the universe, the setting, the cyberpunk, and really be true to the original Syndicate, and that's it," he said. While I enjoyed Syndicate - particularly the co-op campaign - I do hope EA takes a leaf out of 2K's book and green lights a game that more closely resembles the source material. If not, I'm sure Paradox will quite happily take my money.